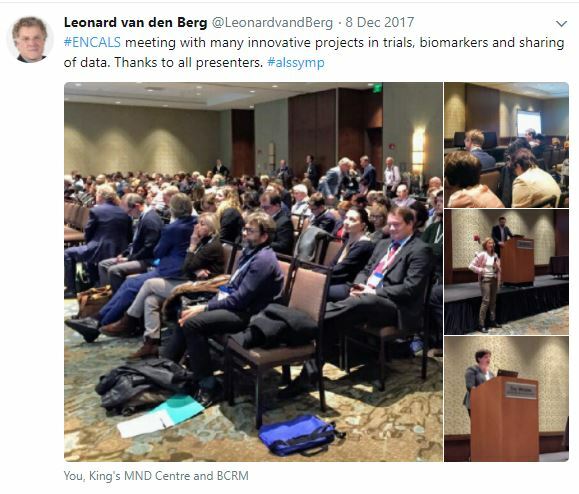 The ENCALS satellite meeting was December 7th, prior to the 28th International Symposium on ALS/MND in Boston, USA. This meeting was well attended with over 100 researchers present, mostly from Europe. 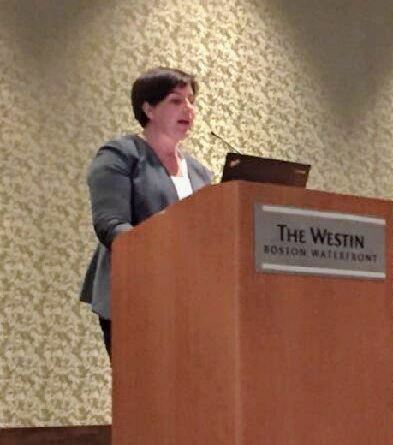 The first presentation was focused on assistive technology devices in ALS. Thomas Meyer, Universitätsmedizin Berlin, presented an analysis of 4 years of platform-based case management. The digitalization of the assistive technology devices (ATD) provision process allowed a data-mining of ATD procurement. Incorporation of ATD indication criteria in international ALS treatment guidelines are urgently needed to improve access to devices. Few other countries have such rigorous overviews of use of assistive devices by ALS patients, but it is known that in many countries there is much room for improvement with high impact on patients’ quality of life. Magdalena Kuźma-Kozakiewicz, Medical University of Warsaw, presented research of end-of-life decisions in patients with ALS/MND. This unique data is gathered in the European project ‘NEEDS in ALS’. With no causative treatment at present, feeding tubes, non-invasive ventilation (NIV) and invasive ventilation (IV) are the main methods for prolonging life in ALS. The legal options for life-shortening methods (withdrawal of invasive ventilation, termination of enteral nutrition, active assistance in dying) vary hugely across Europe. In Poland these are not allowed. Results showed that the Polish caregivers had a positive attitude towards non-pharmacological methods of prolonging life in ALS patients. There is a need to improve the system of informing patients and their relatives about the treatment possibilities in advanced stages of ALS. 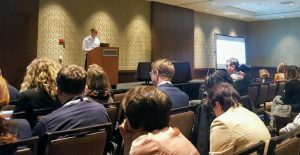 Ruben van Eijk, UMC Utrecht, the Netherlands presented his work on personalising participant selection in ALS clinical trials. By recruiting ALS patients with a specific subtype of ALS, clinical trials would have much more homogenous participants and treatment effects could be detected earlier. Another innovative approach to trials is to apply the ALS staging method to clinical trials, presented by Ton Fang, King’s College London. While it is well known that Riluzole prolongs life in ALS, we actually don’t know when this benefit occurs. The results showed that the ALS patients using Riluzole had significantly longer time in Stage 4 (the latest disease stage before death) compared to those not using Riluzole. The use of the King’s staging system in analyses of clinical trials has potential to show benefits of experimental therapies. As Alberto Albanese, coordinator of the European collaborative consortium trial of TUDCA in ALS was unable to travel to Boston, Leonard van den Berg presented the plans for this Horizon2020 study. Six research centres across five countries will participate in this large multicenter trial that is scheduled to start late 2018. Philip Van Damme, UZ Leuven, Belgium, continued on his research of elevated phosphorylated neurofilament in serum and cerebrospinal fluid of patients with ALS. This method might have the potential to become an important biomarker in ALS. It could also assist in the diagnostic process. From the USA National ALS Registry, Paul Mehta presented opportunities for data sharing. It is encouraging to see that more and more (bio) data is available for many researchers focused on ALS. Another project that is keen on data sharing, following the principles of FAIR data, is project MinE. This large international genetics research performs analyses on whole genome sequencing (WGS) data. Jan Veldink, UMC Utrecht, the Netherlands, showed that nearly 10,000 DNA profiles of ALS patients and controls were analysed with WGS. This has already created a huge and very detailed dataset to find more genetic causes of ALS. Last but not least Mark Heverin from Dublin provided an update on the ALS-CarE Project, to compare the care provided to people with ALS in several European countries. With large differences in European health systems, patients in different countries experience various problems in their care. There is much that we can share as to improve the care in our countries. For now the collection of data is ungoing and many analyses to be done, starting end of Q1 on the first time point (first visit).